This question came to Margaret Locarnini and Clara Reida more than once, and their response forms the heart of this story. Meeting at Girl Scout Camp while working as horse guides, Margaret from Oakland, California and Clara from Rago, Kansas, they discovered they both held the dream of raising horses in the Colorado Rockies. By joining forces they believed they could make their dream come true. Undaunted by the many barriers women faced as recently as 1965—simply acquiring loans without husbands signing for them as one shocking example—they moved forward, dotting the “i” and crossing the “t” on “irrelevant” as far as convention was concerned. 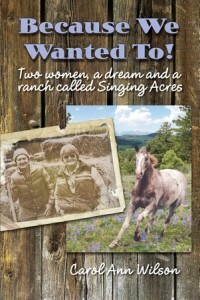 Naming their ranch Singing Acres to honor their deep love of singing and the way the land sang to them, they faced numerous hardships with courage and humor; they cultivated friendships, raised beautiful horses, helped countless others; and became the heart of a community.